New built-in chat. 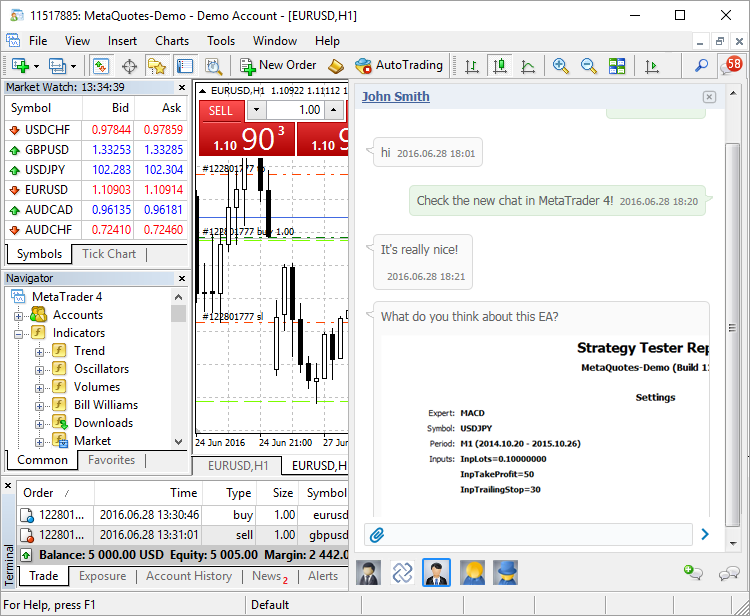 Now, traders can chat with their MQL5.community friends and fellow traders straight from the platform. The chat maintains the history of messages, as well as it features the number of unread messages. To start a chat, log in to your MQL5 account straight from the chat window or via the platform settings: 'Tools' -> 'Options' -> 'Community'. Optimized reading of the internal mail database when the terminal starts. Added an option to show/hide the price and time scale on any chart. In earlier versions, an MQL4 application could only change the CHART_SHOW_PRICE_SCALE and CHART_SHOW_DATE_SCALE properties of the chart, on which it was running. New MODE_CLOSEBY_ALLOWED property for the MarketInfo function. TRUE means that the Close By operation (closing by a counter position) is allowed for the specified financial symbol. Fixed passing of a string parameter to the OnChartEvent entry point. The error could cause a false value of the parameter. OnChartEvent allows tracking chart events: keypress events, mouse movement and more. Implemented faster deletion of multiple graphical objects using the ObjectsDeleteAll function. Fixed stamping of graphical object creation time during testing. In earlier versions, the current terminal time was added instead of testing time.